Watched Eastern Promises tonight. If it had been made for American audiences, the mafia in Eastern Promises would have been Italian (if it had been set a century ago) or Mexican (if it had been set in the present day). 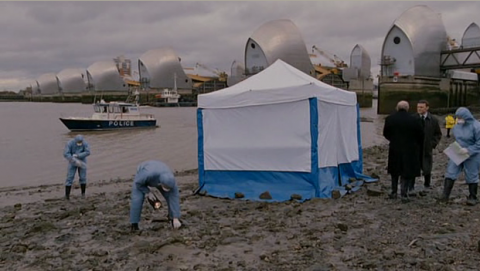 Instead, the movie is set in present-day Britain, and the mafia is Russian. Russia is no longer a Cold War power capable of cunning and audacious power plays around the world. Instead, it’s a corrupt petro state that on the small scale exports heroin and on the larger scale causes havoc throughout Europe. SOFIA, Jan. 8 (Xinhua) — Bulgaria has taken emergency measures to deal with gas crisis after Russia cut off all natural gas supplies to Europe through Ukraine. Suspension of natural gas supplies from Russia forced the Bulgarian government to order rationing for utilities, schools and hospitals. Energy and Economy Minister Peter Dimitrov signed an ordinance Wednesday night during a meeting with representatives of large gas consumers, aimed at reducing Bulgaria’s daily natural gas consumption from 12 million to 18 million cubic meters per day to 5.7 million cubic meters per day. At present, Bulgaria has cut gas supplies completely to 72 big industrial consumers, while the supply for another 153 factories was rationed to enable them to maintain minimal operation. In addition, 84 of 2,761 state schools were closed due to the lack of heating, the government said. In addition, trams and buses in the capital of Sofia switched off heat to save energy. Utilities said they will switch to alternative fuels before they can heat homes again. What did Bulgaria do to deserve such a fate? Nothing. Bulgaria is cut off because of Russia’s natural gas embargo of Europe. Why is Russia refusing to sale natural gas to Europe, especially considering that todays natural gas prices are only going to go down? Because Vladimir Putin has so mismanaged Ukrainian relations that the only thing to Yeltsin-era allies of Russia (former bureaucrat Viktor Yuschenko and former oligarch Yulia Timoshenko) agree on is that Russia is their greatest threat. Like Yasser Arafat and Saddam Hussein (other men quite good at monopolizing power inside a country and very bad at doing anything with it), Vladimir Putin never seems to miss an opportunity to miss an opportunity.